Children’s Wish Foundation of Canada works with communities across the country to provide children with life threatening illnesses the opportunity to realize their most heartfelt wish. The Children’s Wish is an organization that is very dear to me. Children’s Wish Foundation of Canada is the largest and only all-Canadian wish granting charity dedicated to granting wishes to Canadian children between the ages of 3 and 17 who are diagnosed with a life-threatening illness. For more than 34 years, Children’s Wish has worked tirelessly to grant heartfelt wishes to over 25,000 children and their families. I have raised money for this organization in the past as funds raised truly support WISHES THAT MAKE A DIFFERENCE. I encourage you to donate by following the link included at the end of this entry. 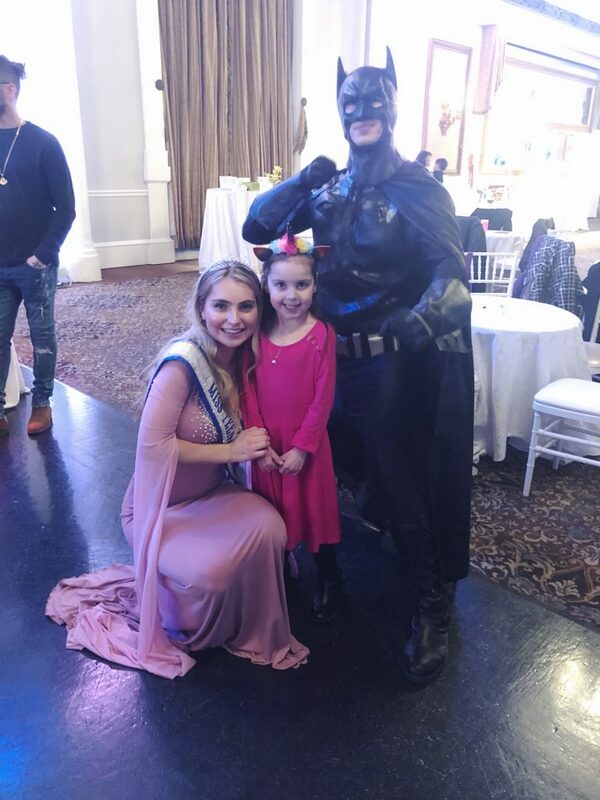 On March 14th I had the pleasure of attending the Children’s Wish Fairytale Land event, (formerly known as Princess and Superhero Party) held in Toronto at the Liberty Grand – The Governor’s Ballroom. The Fairytale Land event brought together the magic of fantasy and fairy tales to the children. Children and their families visited with Princesses and Superheroes, and got to mix and mingle with favourite cartoon characters such as Elsa , while enjoying many interactive games, fabulous music, and of course delicious treats! The night was a memorable night and I had so much fun! There were horse-drawn carriage rides, superhero skills training and games, face painting, craft stations, and just having fun with favourite princesses, super heroes and characters. I danced the night away with a bunch of little princes and princesses, it was so heartwarming. I am so thankful to have been able to attend. It was such an incredible event! I even had a picture taken with batman and my little prince charming and an adorable little princess. I also got to hold a live snake. I honestly don’t know if I was more excited or terrified but I think I am leaning toward terrified! Regardless, it was truly a wonderful event in support of making wishes come true. Thank you for reading and thank you to those who decide to donate and support the Children’s Wish Foundation! Your donations are truly appreciated. 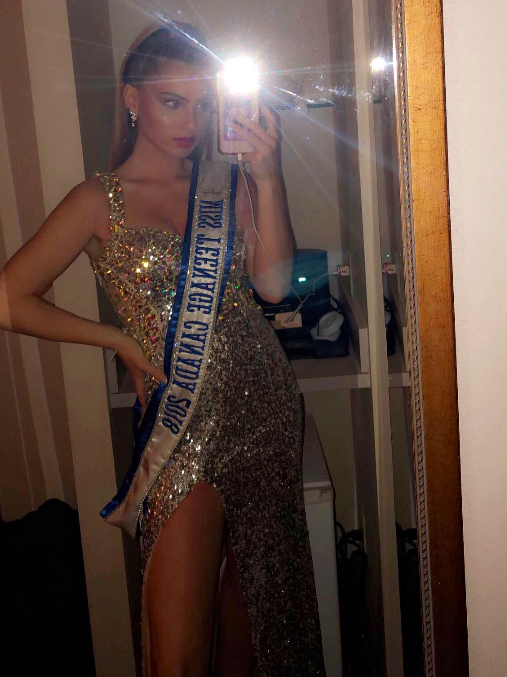 This past weekend was the Miss Teenage Ontario 2019 pageant, and I am so happy I was able to attend. It was such a fun weekend, and a big reunion. Miss Teenage Ontario 2018, Miss Teenage Kawartha Lakes 2018, Miss Teenage Waterloo 2018, and myself got to get together once again! 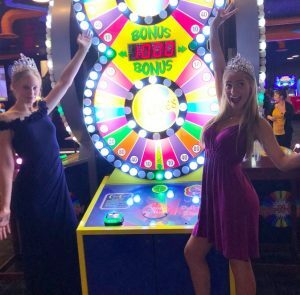 These girls got to crown the new group of girls who will be competing at Miss Teenage Canada this summer. 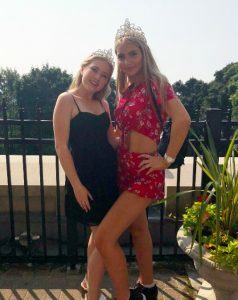 On the first day of the competition Me and Liv (Miss Teenage Kawartha Lakes 2018) got to go down to the venue and meet the girls competing. We got too see them practice walking and choreography. We also got to sit in on preliminaries. 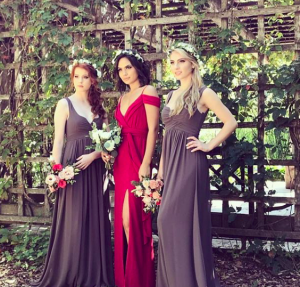 The girls were stunning! Following the prelims, Aleria, Liv, Avery and I went out for dinner to catch up I haven’t seen them since the Miss Teenage Canada Competition in August. The next day (finals night) we got ready and went to the venue. The girls got hair and makeup done by my absolute favs Modern Makeup Canada. You could feel the excitement and nerves backstage. 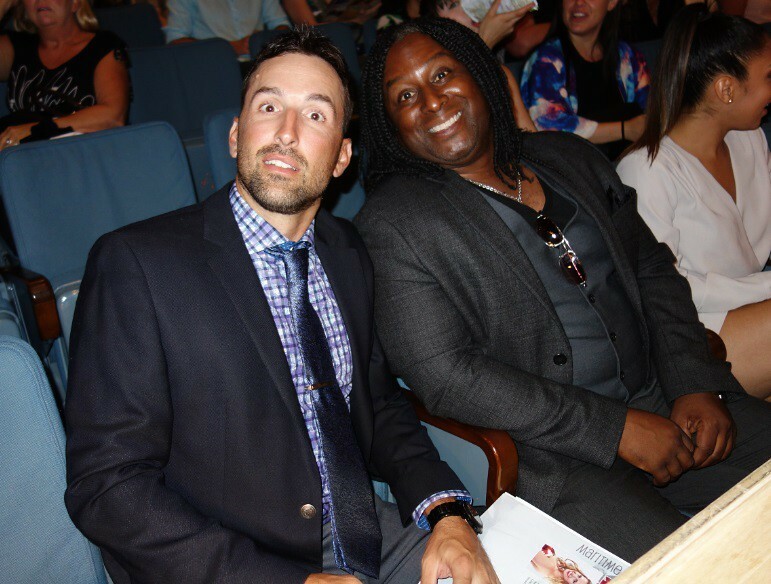 The show started and me and Hanna (Miss World Canada 2018) sat front row! The show started off with the opening number which is always so much fun, then all the contestants introduced themselves, and may I say there was a ton of amazing girls competing. Following was the evening gown, and platform presentation. The girls looked beautiful, and were so inspiring. Then came swimsuit presentation, and the final parade. Finally the crowning ceremony. 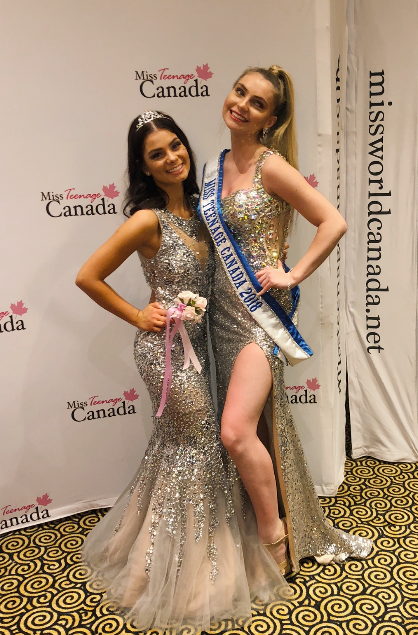 My beautiful friend Aleria (Miss Teenage Ontario 2018) crowned her successor, followed by the stunning Alice (Miss Ontario World 2018 & Miss Intercontinental 2018) crowning the new Miss Ontario World 2019. The end of the night was some sad goodbyes after the weekend reunion, I miss my friends already, but I will see them soon. 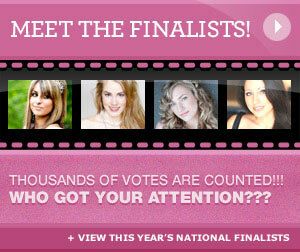 I am beyond to see these new girls compete this August at Miss Teenage Canada. They are in for one of the best weeks of their life. I am still so grateful for the week I had and the girls I am still friends with today. I am writing a blog post about some recent projects I have been working on! I have done two photoshoots recently and I am so excited to talk about them, and share some results! At the very end of August I had the privilege to model for “Hush Collection,” for the 2019 magazine! Hush is a Winnipeg custom bridesmaid dress boutique located in the heart of Osborne. It was so much fun shooting with these lovely ladies, I got to try on so many of the new 2019 dresses! Huge thank you to my agency, Panache for this placement I love you guys so much. I absolutely loved the team I worked with! I can not wait for you all to see the look book in January! These ladies are so talented, and fun to work with. So much talent from the makeup artists, hair, to the photographer, and stylists. We had the photoshoot in one of my hometowns most famous spots…Assiniboine Park (if you ever find yourself in Winnipeg you MUST visit Assiniboine Park, known for beautiful gardens, entertainment, the zoo and more.) I can not wait for the Magazine to come out! Stay tuned! Here are some sneak peeks from the shoot! Stay tuned for the final images. 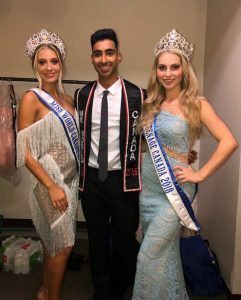 This past weekend I had the privilege to judge the Mr and Miss Global Asia Manitoba pageant, and kids talent show along side my friend Hanna (Miss World Canada 2018.) The weekend was full of amazing talent and wonderful performers. The following day the judges met to prepare for the final night. This included reviewing the judging sheets, including judging criteria. This was my first experience judging a pageant therefore I was focused on ensuring I understood the criteria, and the rules. I was so excited and honoured to be the youngest judge. The finals evening arrived. All of the judges meet after getting hair and makeup. We are introduced on the stage, then go take our seats to view the show. The show starts, and you can feel the excitement surging throughout the audience. There are so many amazing performers like LIVE dance crew which is a Winnipeg Hip Hop Dance crew. There were many entertaining performances. The talent of delegates and the kids kept the audience on the edge of their seats. The delegates portrayed both confidence, and poise, making judging difficult. The night was a lot of fun. The next night is the after party where the contestants, the judges and the organizers of the event enjoyed an evening of food and festivities. 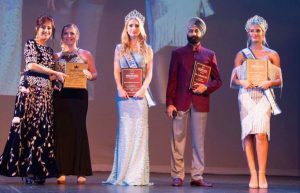 It was great to be on the judging panel with Hanna Begovic (Mss World Canada), and I was sad that she returned to Toronto early the next day. 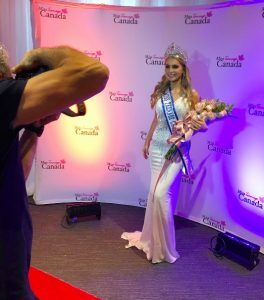 I very much look forward to returning to Toronto very soon for another adventure, and to once again connect with the very inspirational Miss World Canada 2018. This was my first event with my title, and it was so much fun and a huge success. I can not wait to participate in more events, to meet more amazing people, and to help make a difference in any way that I can. Hello! 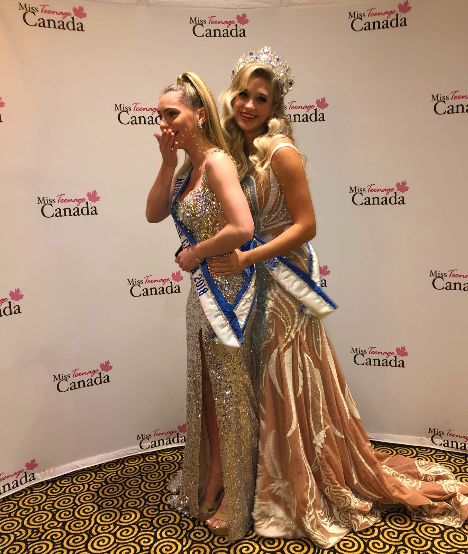 I am Kate, Miss Teenage Canada 2018. I am 17 years old and am from Winnipeg, Manitoba. Wow, I have finally had time to process my trip to Toronto! I had the most amazing week, and met the most wonderful people. I am so thankful to have had this experience, and I am honoured to now represent Canada internationally this November. My week in Toronto started off with an early rise heading off to the YWG airport followed by a turbulent filled flight before finally landing in Toronto. I collected my luggage (although part of it did not make it to Toronto), and then take a tour bus to Centennial Collage where I meet my three FABULOUS roomies. We have our own little party before heading down to the welcome party. It was such a privilege to meet three amazing girls. Day one was a success. I loved meeting all the other delegates and was amazed and impressed with each delegate and was truly honoured to finally meet these amazing, intelligent, and gracious ladies. Day 2 is the photoshoot, video shoot, and interview. I had so much fun getting hair and makeup done. First was the video shoot and next the photoshoot. Later on I had my interview. It was so much fun working with the MTC team, the photographers, and the hair and make-up artists. WOW! What a great experience working with everyone! After all these activities were done we had rehearsals to learn choreography for the final show. A busy but fun schedule! Day 3 is adventure day! We went touring around Toronto. This was unreal because I have never been to Toronto. We start our day off at the beautiful Casa Loma. We learned all about the castle’s history and had the privilege of taking a tour. Following our visit to Casa Loma we went downtown to the CN tower. We had the opportunity to take pictures by the Toronto sign. The tour bus experience was so much fun (although the driver may have had a different opinion! ). We all jammed out to songs on the tour bus from destination to destination. The next place we venture to is the Yorkdale Mall! Honestly, I could spend forever in this mall. The mall has so many stores which we don’t have in Winnipeg! We stop in at Gucci, Kate Spade, Versace, and so much more. Oh, I of course can not forget about Brandy Melville. One of my favourites that is not in Winnipeg!! To finish off our day we go too Dave and Busters for supper (another unreal place we do not have in Winnipeg.) Essentially it is a restaurant and arcade in one. You can play games to win prizes. It was honestly so much fun. Definitely a place I would like to go back to. Friday, Day 4 includes rehearsals and the preliminary competition. We wake up and practice more choreography for the final show which is to be the following Sunday. Then later on in the evening we pack our outfits for the preliminary competition. Preliminaries determine the top 20 for Sunday’s (the final) show. We are judged in evening gown, and swim suit. This night was so much fun! I loved getting out on stage – it gives me the best feeling, like a rush of adrenaline. All the delegates did so well, and everyone looked stunning. After the show we eat supper and get some well deserved (and needed) rest! Day 5 rolls around which is the talent competition, and platform presentation. The morning includes rehearsals to refine our choreography. We prepare for the talent night. We finally arrive to the venue and get everything set up and practice our talent and platforms presentations. For my talent performance I choreographed a lyrical dance solo to a cover of “The Climb” I sang and recorded. It was such an honour to place in the top 4 talent which allowed me to preform again at finals the next day! The talent night was a huge success and everyone shined on stage. I had the privilege of watching truly amazing talent performances, but what also so impressed by the platform presentations and how dedicated the delegates are to giving back to the community. How could one not be inspired? 17 year old Katelynne Lawrence from Winnipeg, Manitoba is your new Miss Teenage Canada 2018! Katelynne is as dedicated to the Performing Arts and her community, as she is to her academics. Kate has always loved singing and dancing, and began her performing arts journey at the early age of three! Kate performed her first professional role at eight years old, in Joseph and the Amazing Technicolor Dream Coat. She later landed a role in the American Girl movie Saige Paints the Sky. Kate believes that it is important to always try to make a positive contribution to the community, and has volunteered at numerous charitable events. Katelynne plans to continue her training in the arts, modeling and academics. Katelynne believes that these skills are integral to achieving her goal of promoting mental health awareness, and in providing an understanding of the potential impact that bullying, and other factors, such as anxiety, can have on one’s mental health. The search has ended. 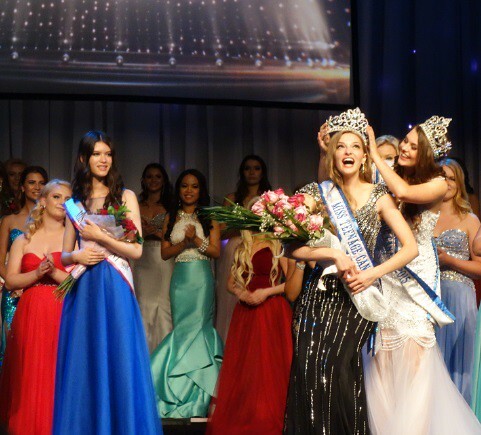 Emma Morrison age 17, was crowned Miss Teenage Canada 2017 on Sunday August 13th. 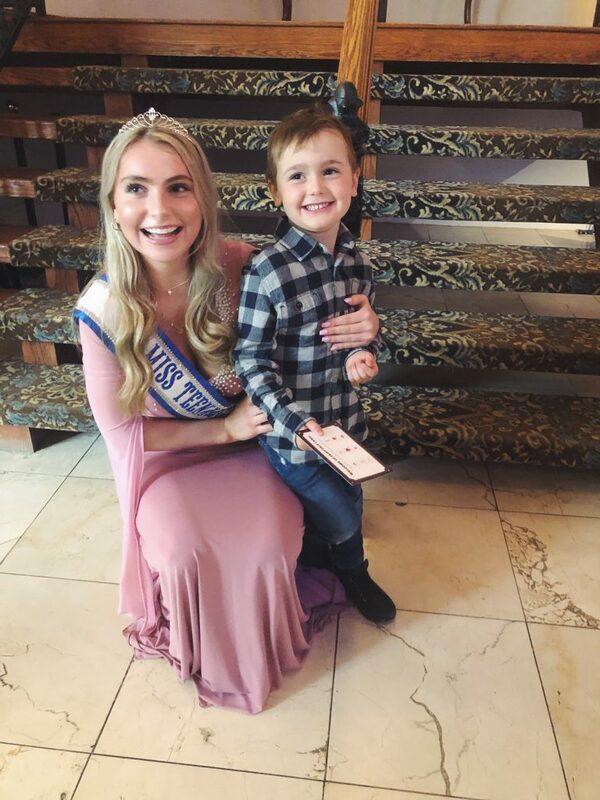 Emma Morrison’s Biography highlights her northern Ontario origins as it explains how she’s eager to “…explore new opportunities, that is how she found her love for the pageant industry. 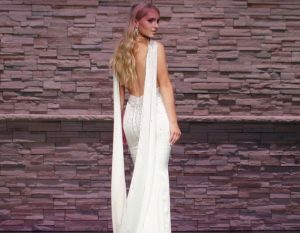 She entered her first pageant- Miss North Ontario Regional Canada- in 2017, and she was crowned that years’ Miss North Ontario. 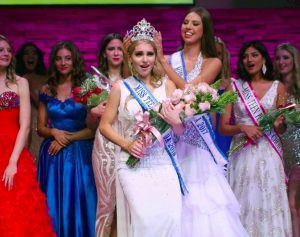 Her crowning on Sunday night in Richmond Hill was exceptional; her mix of laughter and tears made it clear to all present that she really wasn’t expecting the honour, and it was beautiful, and wonderful, and overwhelming. It all happened so fast. Samantha Pierre took her last walk to music with a voice-over track articulating her thoughts on her year. It was very funny of course as Samantha is a real comedian, but sad too as she thanked her supporters and waved to her mom. 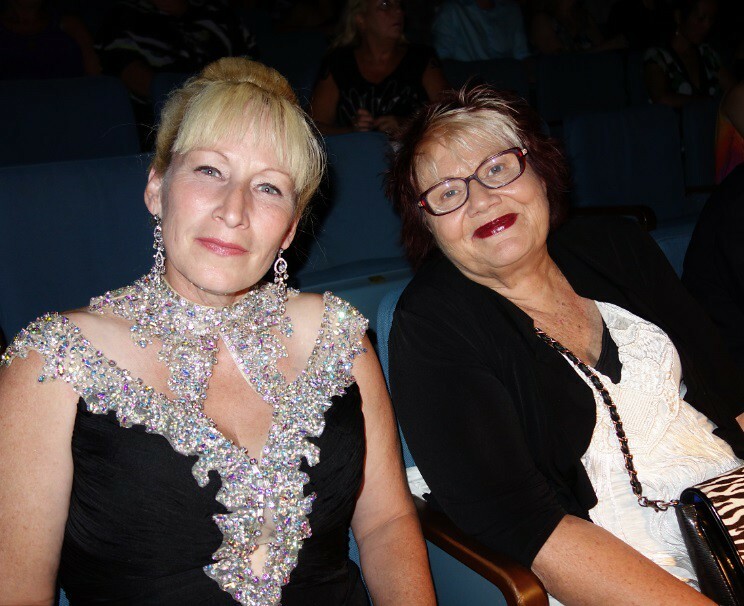 Top Five Finalists waited in their evening gowns to learn their fates from Alice Li and Cynthia Menard, the hosts of the 2017 show who read the commands of the Judges contained in a paper envelope. One by one the finalists were let go until there was only two delegates remaining, Miana Lauren and Emma Morrison. Miana is a a grade twelve student from London, Ontario who had reigned as Miss Teenage Ontario 2017 since February. Emma Morrison comes from Northern Ontario Pageants and was only recently ‘discovered’ in that circuit. This beautiful person captured the respect and affection of all seven Judges and was crowned Miss Teenage Canada 2017 just a few moments after Miana Lauren was named First Runner-Up. Sophia DeCarle, in the green dress placed third. For Emma Morrison,age 17 and everyone else on that stage, it was a long journey getting here. 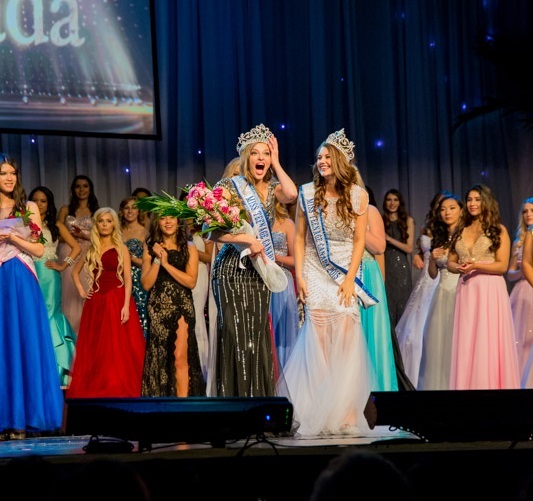 The path to the Nationals required entering and winning regional pageants. 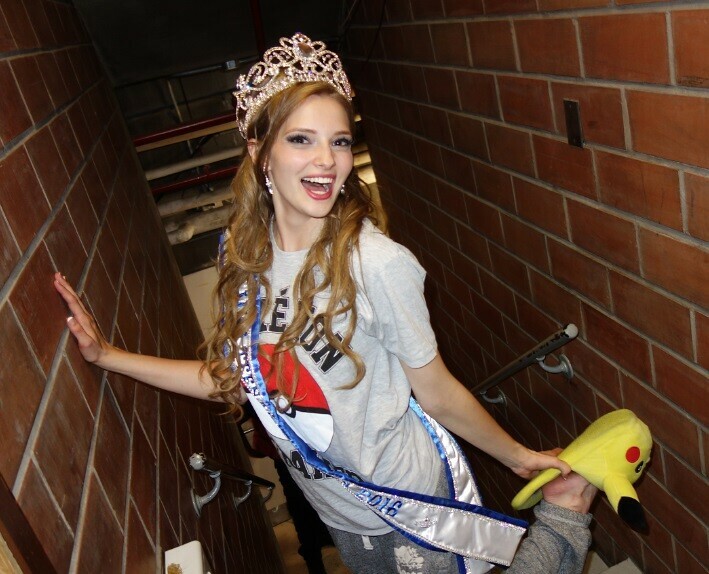 It required organizing and fundraising for pageant expenses and charity, and doing photo shoots and interviews. Contestants were judged in a preliminary pageant earlier in the week and a gala show the night before this, the grand finale. 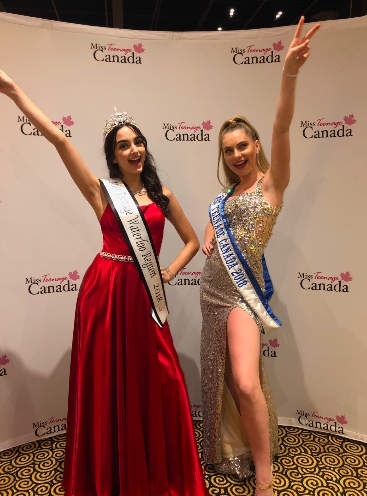 Sophia DeCarle and Shiela Antoniette L. Montes backstage at the 2017 Miss Teenage Canada Preliminaries. Below is a well decorated delegate getting the most professional touch-ups from Jennifer Turner of Modern Make-Up mobile event makeup which does all the hair and make-up for all the delegates each year. Filled with photo shoots while making new and possibly life long friendships. Adanna Taylor – in the chair at Modern MakeUp And dance. There was so much preparation for this final show. Every musical number had to be learned to make a cohesive presentation on stage Sunday night. Learning our famous choreographer’s dance creations is no easy task. What the delegates didn’t know is that the dance pieces get harder and more complex every year. Like a product engineer designing a complex piece of machinery with many moving parts, so to does our dance choreographer move sixty delegates around the stage to show them off in the most visually striking manner possible. Toronto dance choreographer Shawn Cuffie is not content to simply have the same dance pieces reenacted by-the-numbers each summer; this artist is growing and improving his work all the time. He’s especially creative when his vision needs to adapt to new stage layouts, new songs and visual themes. And new dancers. This last ingredient is the most important element because without some naturally talented people in the mix, the whole number will fall flat. And let’s consider all the people who worked hard behind the scenes to make the night possible. Technicians like Merve from Music 21 who does all the lights and backdrops. 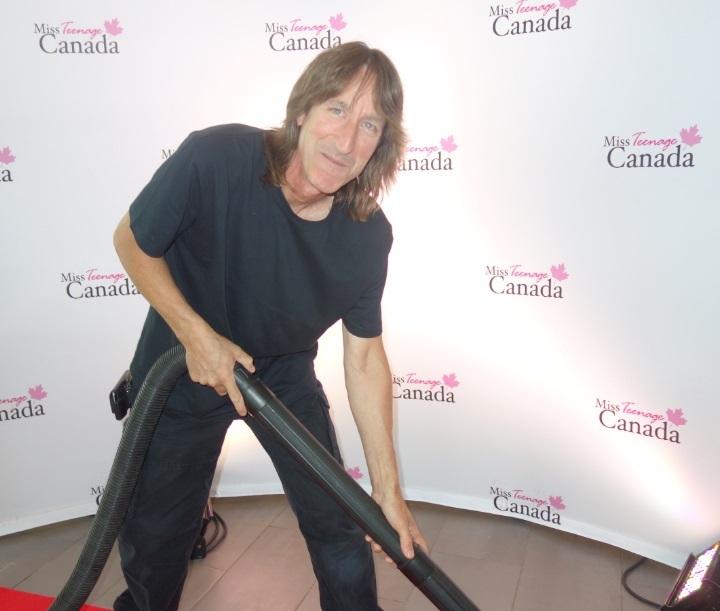 He even makes sure the red carpet out-front is spotless. Delegates dined on delicious snacks. Below are the ‘Vegetable Overload’ type MTC 2017 Supermodel Survival Packs that were made and donated by grocery sponsors to feed the girls during their long hours of dance practice. The stickers were printed by Sign Source Solution in Vaughan and applied to the plastic vessels as they were filled with fresh produce. 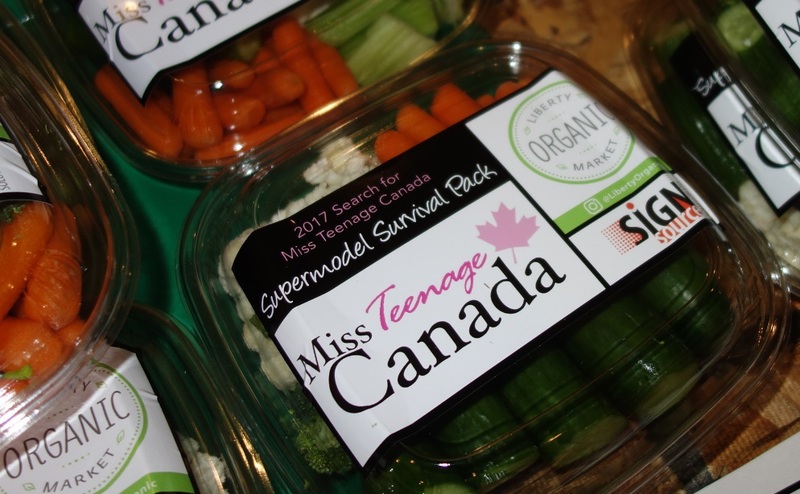 Super Model Survival Packs are sponsored meals donated by Amico’s Pizza and Urban Fresh Produce and Liberty Organic Market in downtown Toronto. Three dozen or more had eggs and cheese and pita bread with grapes. Together the two packs could replace a meal. The delegates devoured a couple hundred of these packs while practicing for the final dances and they took whatever was left to munch on later in their rooms at night. Dance practice happened all week long in the hotel ballroom, with new steps and sometimes whole new numbers being learned everyday. Dress Rehearsal happened at the Richmond Hill Centre for Performing Arts all day Sunday the 14th of August, and right up until the curtain dropped at 8pm. At seven o’clock that evening, the family and friends of the delegates began appearing outside and in the foyer of the building. 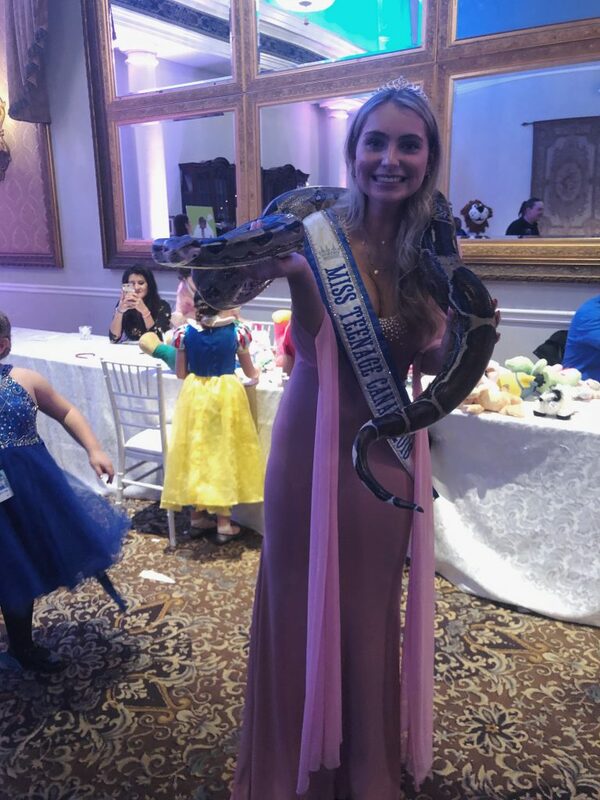 Below is Marina’s older sister who got close enough to share the photo with Joanna Szene, Miss Ontario World 2017 whose sash and crown makes her very welcome at these events. The Judges, Damien Chen , and Mauren Fenn were caught completely off guard by this author’s camera as they met in the foyer. And here’s Dahlia DeSouza from UptotheTime Watches who has an incredible sense of style and great presence in any assembly of fashionable women. She was honoured to lend her critical eye as Judge at the proceedings. The evening started at 7:30 pm with a meet and greet and general kibitzing. Then as parents started becoming aware of the Judges, they were sequestered. Ryan Weswaldi led the pack away from the prying pr agents, gown suppliers, helicopter parents and any people who may have some stake in the game. 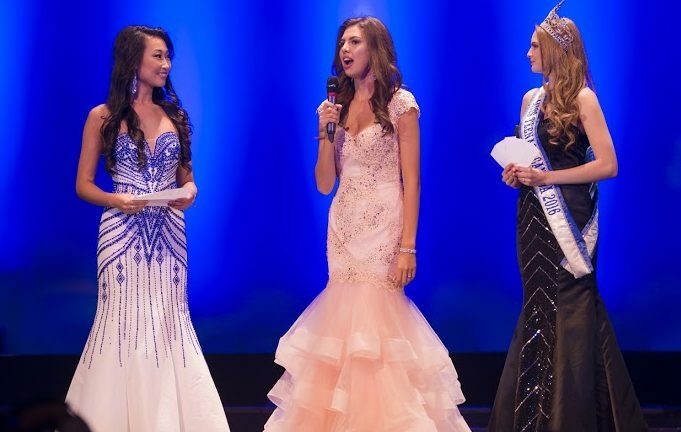 Hosts Alice Li, 2017 Miss Toronto World, and Cynthia Menard 217 Miss World Canada (unseen to the left at the podium) asked the Five Finalists their interview questions. 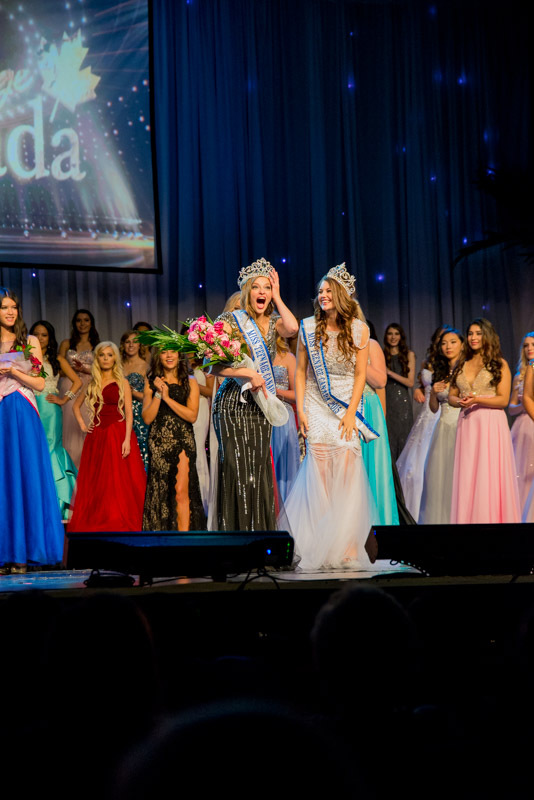 Emma Morrison is seen answering beside Samantha Pierre, 2016 Miss Teenage Canada. Beauty pageants are similar to Survivor -style reality game shows. The contestants are narrowed down to the Top Twenty Finalists right at the start of the evening (playing all the two minute video biographies took almost a half an hour) and then more were let go and more and more and more until there were only five delegates remaining. And we all know how it turned out – Congratulations Emma Morris0n! Below is the DeCarle family after the show – Sophia is the oldest of four sisters. 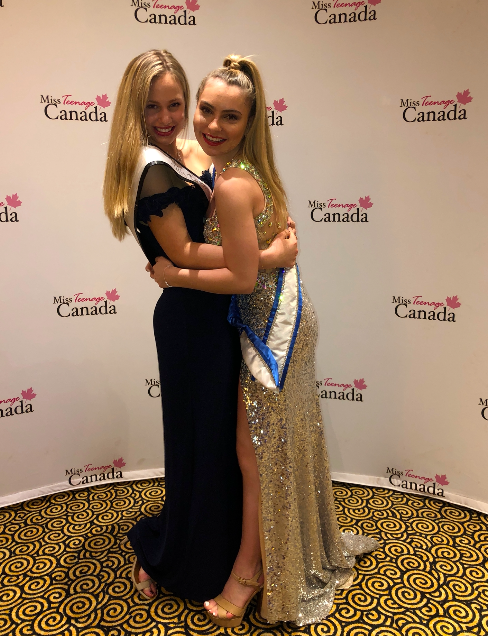 The Miss Teenage Canada pageant is an emotional roller coaster to be sure; it has its ups and downs and moves slow at times and then really fast in other instances. The heights are dizzying and the memories intense, but there are painful moments too. All things considered though, for young women seeking experience in dance, fashion and the performing arts, its a pretty amazing ride. Congratulations Samantha Pierre. 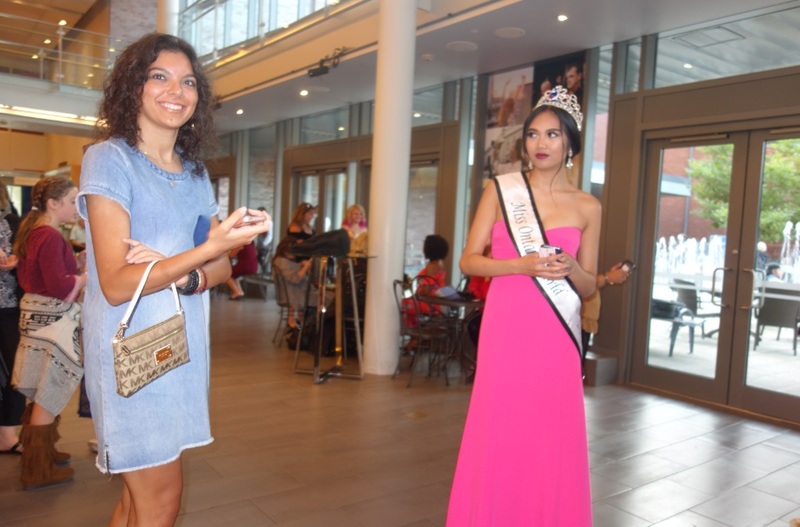 The 2016 Search for Miss Teenage Canada came to its dramatic conclusion on Sunday July 24th in a packed house at the Queen Elizabeth Theatre in Exhibition Place Toronto as the Hosts, Ricardo Hoyos, and Delaney Holley a Canadian singer opened the envelope and announced that Samantha Pierre (Miss Teenage Ottawa 2016) had won the competition and would be the new national titleholder. The Judge’s votes were final, and Samantha had won, narrowly defeating Chloe, Miss Teen Alberta who will be this year’s first runner up. 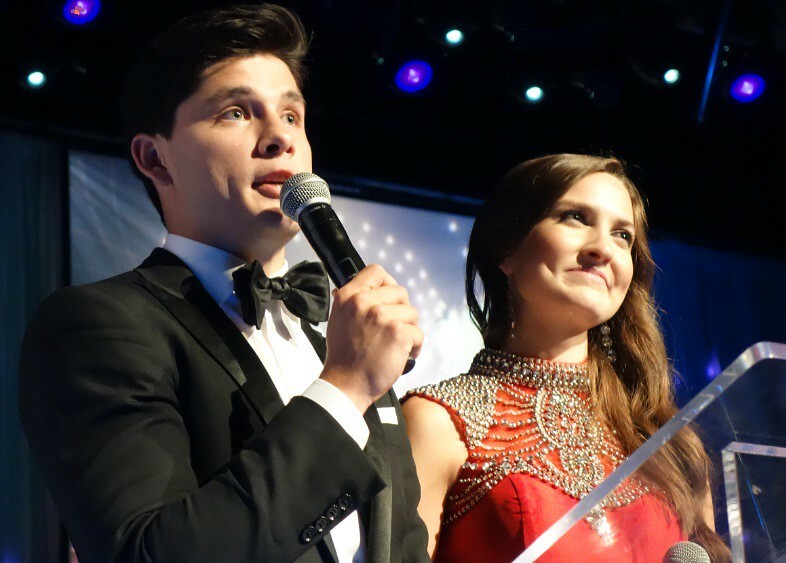 Degrassi star Ricardo Hoyos and singer Delaney Holley did a great job hosting the 2016 live event. Hosts Ricardo Hoyos, a Degrassi star, and Delaney Holley a local singer songwriter really built up the drama at the end of the night. At 10:30 pm, after all the Judges’ scores were tallied, Samantha Pierre clinched the title and received all the glory encapsulated in having the official crown and sash conferred upon her by last year’s titleholder. Samantha also won a ton of amazing prizes from sponsors totaling well over twelve thousand dollars worth of goods and services, trips, clothes and a hoard of make-up and jewelry. This is a big deal for her – she has one year to sprout and shine as a junior celebrity in the difficult Canadian media market. Here are the top five delegates, Hanna, Chloe, Kathleen, Samantha and Precious. 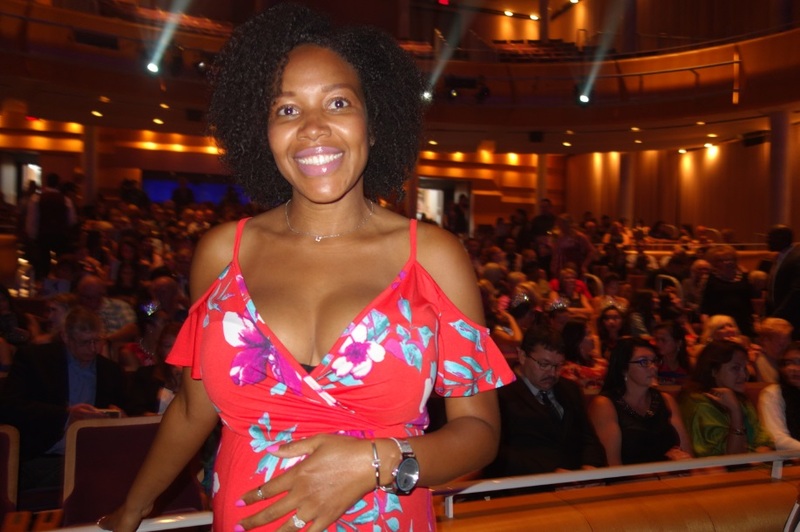 The Queen Elizabeth Theatre in Toronto roared with applause as Samantha’s new title was announced. There were about four hundred people in the audience and everyone there was cheering for one or another of the fifty-four delegates in the show. Whenever that person appeared on stage they hollered their support. Delegates from faraway places who had no cheering section present on Sunday had to be content knowing that another five thousand people or more were watching the show online via Facebook Live Stream and cheering their city’s delegate or friend from their region. The entire production was also video recorded of course, and in time the show will be made available as high quality DVD or online download. 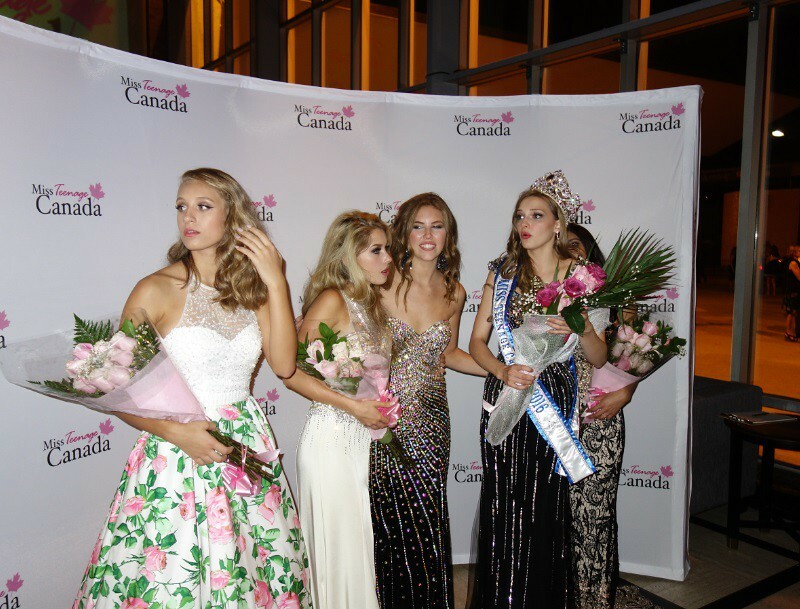 The Annual Search for Miss Teenage Canada Tests Beauty, Brains and Blogging Skills? Its a fact this competition is the only national level talent search in the world where as many as sixty five competitors must keep a WordPress blog and write out their weekly adventures as regional titleholders and upload original photography of their own events. And they must raise money for charities and use their social media channels to promote their own and other charity events in their region. 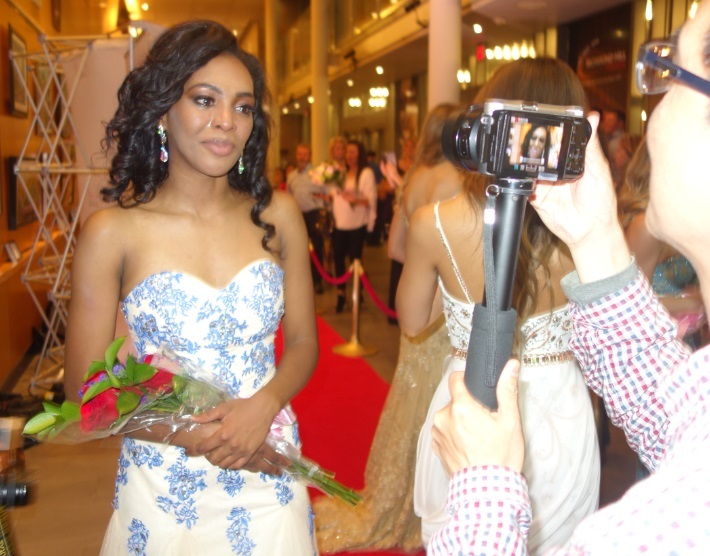 Miss Teenage Ottawa 2016, Samantha Pierre won the crown and sash because she was exceptional from the first moment she arrived in Toronto. 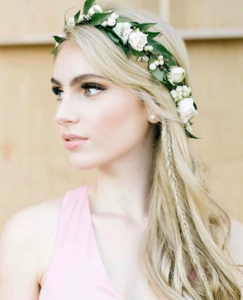 She will be the new Miss Teenage Canada 2016 and represent Canada at international competitions. Samantha Pierre is just eighteen years old; this is her first national competition. She has appeared on stage before, but as a singer and stand-up comedian at community events. Her musical comedy number, a song & dance routine performed on the national stage on Sunday night went off without a hitch, and stood in sharp contrast to the fashion beauty parade that was otherwise being presented. In her comedy act, Sam wore giant Pikachu (a Pokemon character) slippers and a sports jersey and sang a funny song about not getting any sleep in a new apartment surrounded by colorful characters. It was a high quality musical – theatre style dance number and a very impressive soliloquy by any standard. By doing this she demonstrated her incredible talent and her powerful stage presence in a live spectacle that ensured all the Judges knew her name going forward. 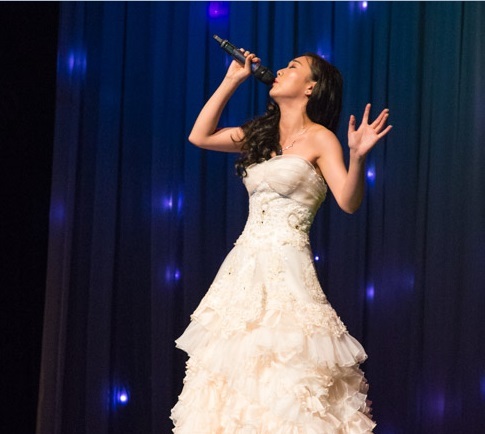 Other notable performances included a song from Evangeline Miss Teenage Vancouver 2016, and a piano recital that was incredibly complex and yet performed perfectly by Rachel Butler, Miss Teenage North Calgary. Judges are a diverse mixture of tastemakers from all across Canada. Angeline McDonald is the owner of Bells & Bows Bridal Centre in Alberta. She’s an accomplished businesswoman and premier supplier of pageant, graduation and bridal gowns. She has been in the bridal industry for over 20 years and has been judging this competition for ten. Maureen Fenn (Moe) was at one time the Executive Director of the largest modeling and acting academy in North America. Bradlee Ryall is one of Canada’s most celebrated golf professionals and an absolute wizard at teaching golf lessons to junior golfers at the Bradlee Ryall Golf Academy at Lionhead and Royal Ontario golf courses where the 2016 Miss Teenage Canada delegates went golfing Weds July 20th morning. Bradlee specializes in coaching teen golfers competing for golf scholarships at major American universities. Training these young athletes comes naturally to him because it wasn’t that long ago he was competing and winning titles all over the world. This semi-famous golf pro is also the co-founder of SWING active wear clothing line for Junior Golfers with his wife Courtney Ryall. Rudy Blair is a local celebrity radio host, TV actor and well known public speaker, he’s been ‘on air’ for almost 30 years. Twenty-three of those years were with 680News as the Music & Entertainment Reporter and during that time he interviewed some of the biggest artists in music, including Beyonce, Jay Z, Ed Sheeran, Katy Perry, Lorde, Gordon Lightfoot, Tony Bennett and Tim McGraw and covered major events, such as The Grammys, Junos, Much Music Video Awards, The Canadian Screen Award and Canada’s Walk Of Fame. Rudy has been honoured with sixteen Radio-Television News Directors Association National and Regional Awards. Anna Golja is a Canadian actress who most recently starred in a feature film called “Full Out”, an inspirational sports drama that aired on NBC, Family Channel and is now on Netflix . She’s currently staring as Zoe Rivas in the Emmy nominated drama, Degrassi which airs on MTV Canada and TeenNick. Taveeta Szymanowicz is a young commercial artist from Toronto, who began dancing at the age of six and has trained intensively in a variety of styles. Like all the Judges she has a large social media following and you can find her @TAVEETA_ on Twitter. Julia Tomasone is an actress and singer who landed her breakthrough role as “Bianca Blackwell” in the Disney Channel series Backstage. Kyal Legend is best known for her portrayal of “Julie Maslany” in the series ‘Backstage’ now airing on Family Channel. She’s a talented actress, dancer,and singer who has toured with Nellly Furtado. When she was a teenager, Kyal trained at The National Ballet of Canada and attended the Alvin Ailey American Dance Theater school in New York City. On Instagram, Twitter, and Facebook she’s found at @kyallegend. John Macintosh is a social entrepreneur and the Founder and CEO of Hashtagio.com, a social media content aggregation solution that quickly and easily shares any organizations’ best moments on their website. These nine Judges had a very difficult job to be sure. Even though the fifty four competitors were reduced to a Top 20 grouping at the start of the night, they still had a lot of options to weigh before selecting Samantha who shone so bright from start to finish. Afterwards there was a photography free-for-all in the lobby of the Queen Elizabeth Theatre in Toronto. Ricardo had a blast to be sure, and he must have drove the PR people crazy as he let the meter run on the cab outside, sticking around in the lobby of the theatre posing for pictures with each of the top five delegates, their families and friends. So let us all congratulate Samantha Pierre again, and maybe set a Google Alert on her name to get updates on her quest for an international crown in August. One thing is certain; Samantha has her own style, and will stand out wherever she exhibits her personality and powerful stage presence.